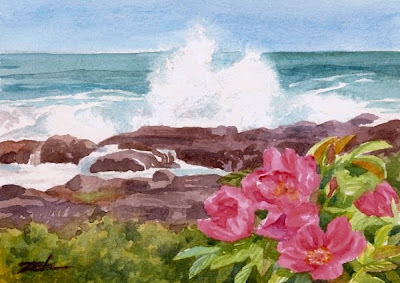 A stunning view of the powerful ocean will be found along the Marginal Way walk in Ogunquit, Maine. Here is one such scene with the ever-present rugosa roses blooming in the foreground. This painting has been sold. See more of my art for sale at my website: zehoriginalart.com. Thanks for stopping by and have a splendid day!